This is one way to make a quick buck . . . The popular site eBay is notorious for users offering haunted items. The following story I found amusing. 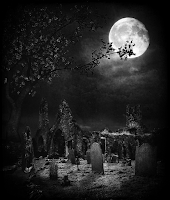 He described a scenario where he was out sketching a spooky mental hospital while he sat in a graveyard one night—wait for it—under a full moon. When he left he forgot to take his laptop with him. He left it in this graveyard overnight. When he returned to retrieve it he found it propped open and playing his favorite Beethoven music—cue the spooky music. This owner stated that soon after this weird things began to happen. He discovered all his songs on iTunes had become “scary or haunted” and his desktop background changed to a scary photo. He then stated the ghost that now inhabited his laptop began to leave him notes. 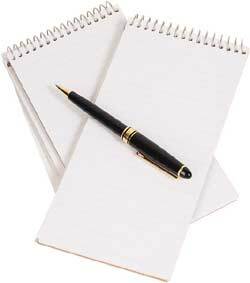 Not typed on the machine’s word processor but instead with pen and paper. The owner here points out that the ghost, not being from a recent era, was not technologically savvy. Considering this, then how did this ghost change his iTunes songs and desktop photo? The final bid on this item reached well over $6,000. 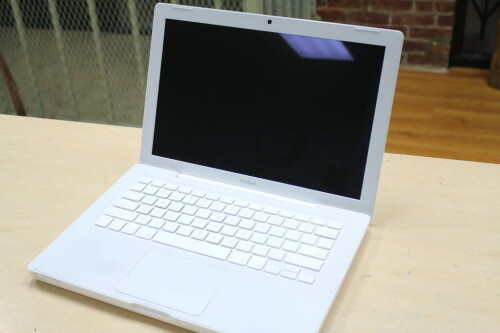 This is six times the value of this laptop when it was new. This is a 1st person account given by a police officer. It had been a bad winter. 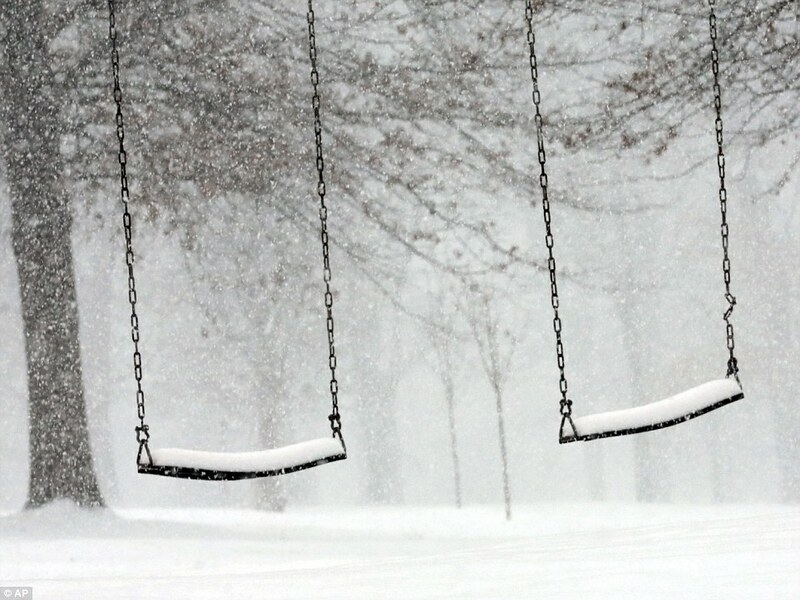 In 1985, we had 18 inches of snow on the ground and more was falling. My partner and I were patrolling the city parks in Roanoke, Virginia. Because of the weather they had been closed for several days. While everyone was safe and warm inside we were out looking for vandals or anyone who might be stealing. Thieves often stole copper pipes when no one else was around. In one remote park we were driving around the perimeter when suddenly we heard a loud bang, then another. We quickly exited our vehicle and plowed through the snow. The bangs where coming from a restroom building. As we neared this building we heard yet another loud bang. It sounded like something metallic. As we approached the door a series of bangs rang out. We pushed the door open ready to confront thieves. Once we were inside the loud noises stopped. We saw one person in the freezing room. It was an older man lying on the floor under one sink. He clutched a walking stick in one hand. Just above where he lay was a series of metal pipes. He must have been the one who made the banging sounds we heard. But as we approached we realized he was dead. Our guess was he had frozen to death. We checked the rest of the building and found nothing. We noted there were only our footprints in the snow outside. A few days later I called the medical examiner. He told me the man was intoxicated and had been dead for at least 24 hours when we found him. As we suspected he had frozen. If it hadn’t been for the banging on the pipes this man would not have been discovered until days later. By then it probably would have been children playing in the park who found him. My partner and I never discovered a logical reason for the bangs we heard. We never heard them again at this park. We have often wondered if they were made by the dead man’s cane. Did he want to be found? This story and many others told by police officers are shared in Loren W. Christensen’s book entitled, Cop’s True Stories of the Paranormal. This book can be found on Amazon. Mercy Lena Brown is famous for being a vampire but her spirit also lingers. 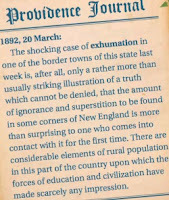 In the 1700s and 1800s New England was ravished by consumption an early term for tuberculosis. Families watched as their loved ones died a long painful death. This illness left its victims gaunt, flushed and with sunken eyes. Relatives stood by helpless as the ill coughed and coughed. Doctors where unable to help. People described this illness as literally sucking the life out of its victims. Entire communities, fearful and ignorant began to rely on superstitious beliefs. Most came to believe evil forces were at work. A widespread belief took hold. New Englanders began to blame what they called the “walking dead” as the reason for their loved ones dying. It was stated these evil entities moved among them at night—and sucked the life out of the living. The term “vampire” was not used but this is what this superstition was based upon. Read more details about this belief in the Smithsonian Magazine here. 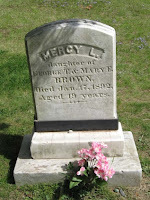 The most famous New England vampire case involved a young woman named Mercy Lena Brown (1872-1892). 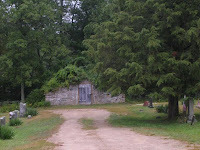 Her family lived in the small village of Exeter, Rhode Island. 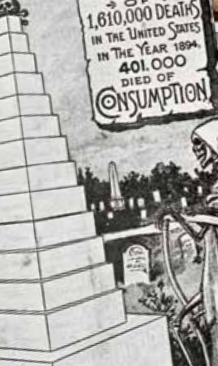 Mercy’s family, like many others, was hit hard by consumption. Mercy’s mother and a sister died. Her older brother Edwin became ill. 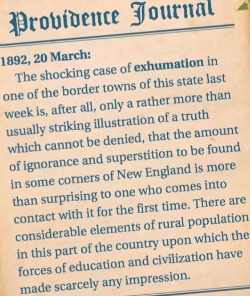 He moved to Colorado in hopes of a cure but returned to Exeter still ill.
Mercy also became ill with consumption. 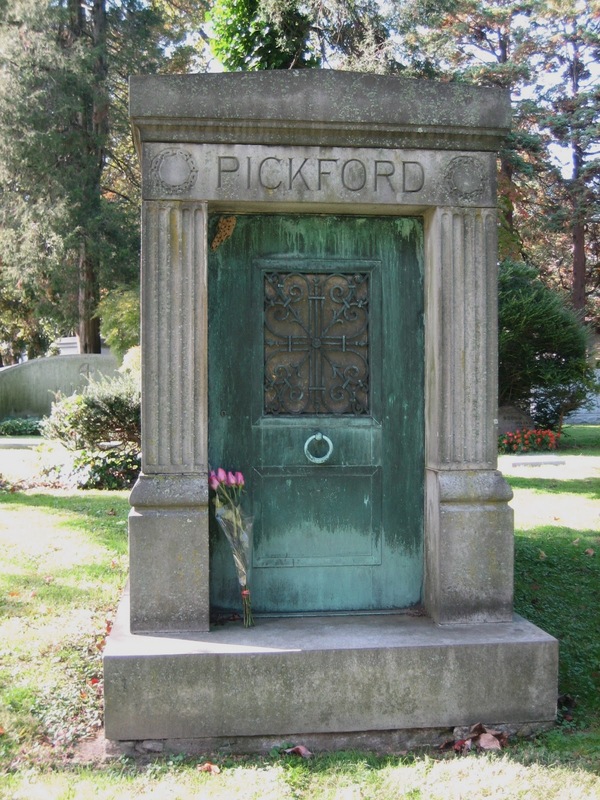 She died at age 19 in winter so her body was placed in a sort of freezer—an above ground vault—so she could be buried properly once the ground unfroze. Neighbors of Mercy's father, George Brown asked him for permission to exhume his family’s bodies. They felt one deceased member must be among the “undead” and was continuing to make his son Edwin ill. George gave his permission. When dug up they discovered the mother and sister had decomposed to bones, which was expected. But when Mercy’s body was examined it had not decomposed—having been kept in the cold vault. The group also discovered congealed blood in Mercy's heart and liver. They took this as a sign she must be among the undead. They then performed a ritual that was believed to release Edwin from this evil influence. They removed Mercy’s heart and placed it on a rock and burned it—this turned it to ashes. They then mixed these ashes with water and had Edwin drink it. But alas, he died 2 months later. 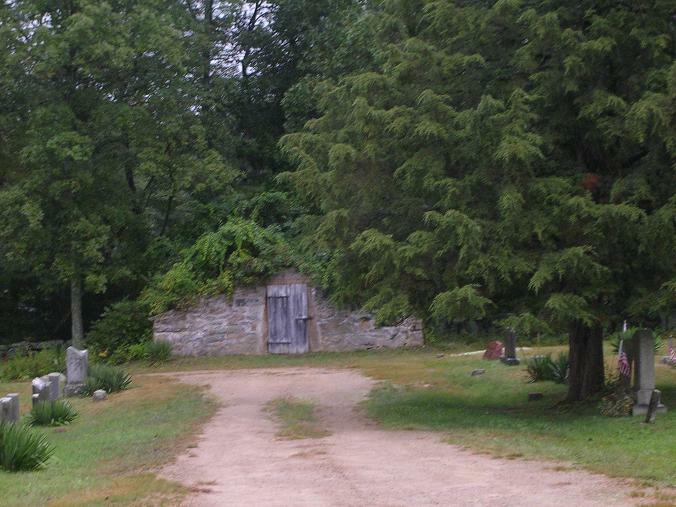 Mercy’s body was among many in New England that were desecrated in this fashion. But her story like the others does not end here. Her spirit has been restless ever since. Over the years people in this small community have reported strange sights and sounds. 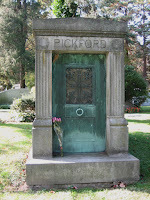 Her body is buried in Chestnut Hill Cemetery in Exeter. 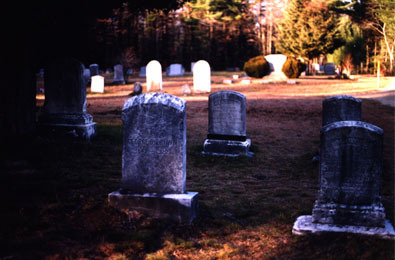 Residents and visitors report seeing strange lights in this cemetery. Witnesses whom have stood on graves in this cemetery state that something unseen shoved them off these plots. Other residents have come forward to state they have seen Mercy’s ghost walking around the community. Those whom have offered prayers for Mercy report afterwards smelling the scent of roses. Mercy’s spirit is known to visit members in the community that are about to die. 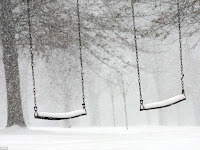 Relatives have encountered their loved ones in earnest conversations with Mercy hours or even minutes before they passed. It appears that Mercy’s spirit is a kind soul who doesn’t want to see any more graves desecrated. She also exhibits compassion for those who are about to die. Today people often leave items on her gravesite. My wish is these items be respectful and not a joke because ignorance labeled her a vampire. 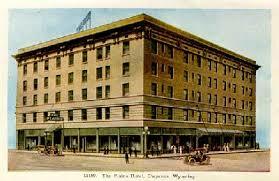 This luxury 5-story hotel in Cheyenne was opened in 1911 to provide a comfortable place for oil barons, rich ranchers and Army officers to stay. It also catered to tourists headed to Yellowstone and the Grand Tetons. 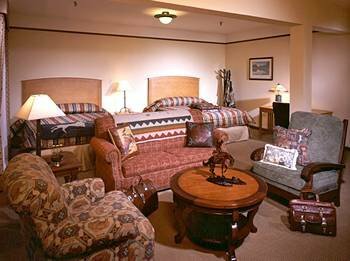 Sponsored by the Cheyenne Securities Company the Hotel's cost including décor and furnishings was $250,000. It has a grand ballroom and a lobby that is provided with extra light from a spectacular stained glass skylight. 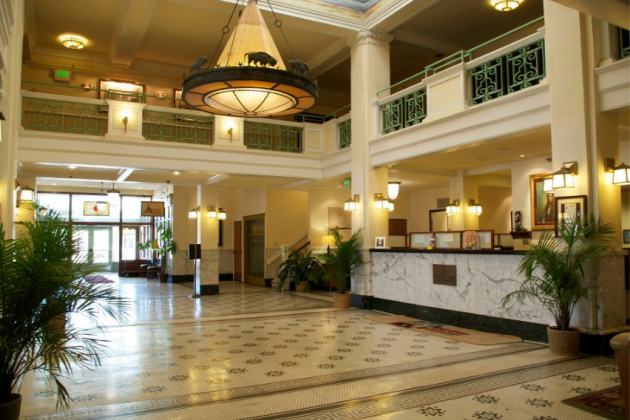 It has a central marble staircase as well as rich mahogany and leather furniture throughout. When it first opened the Mezzanine featured an orchestra that played for its distinguished guests. 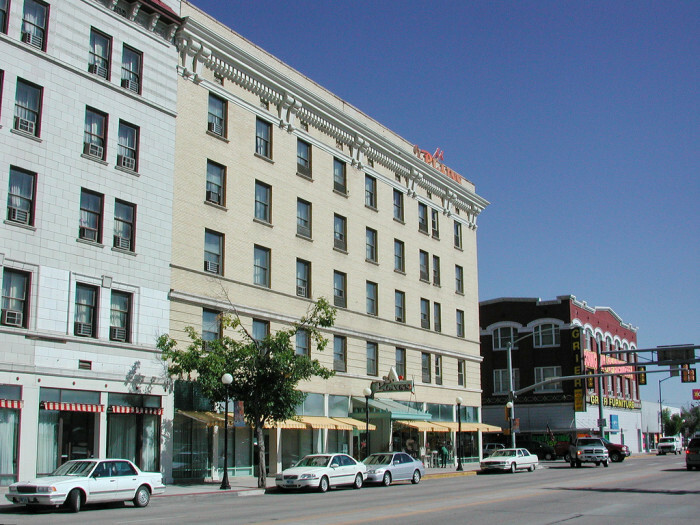 In more recent years, Presidents Truman, Nixon and Regan all stayed at the Plains. Each of its 100 guest rooms had plush velvet carpet, phones, private baths and large brass beds. The Plains has been renovated twice, first in the 1930s and then again in 2002. 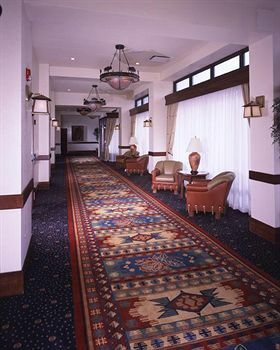 Many guests today still enjoy its cowboy themed luxury. 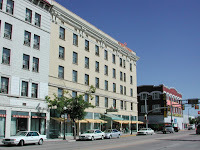 People who promote the Plains Hotel are not shy about another feature it has. 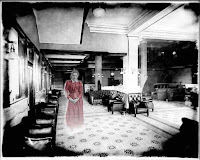 Violence that occurred in hotel in the past has resulted in four resident ghosts. 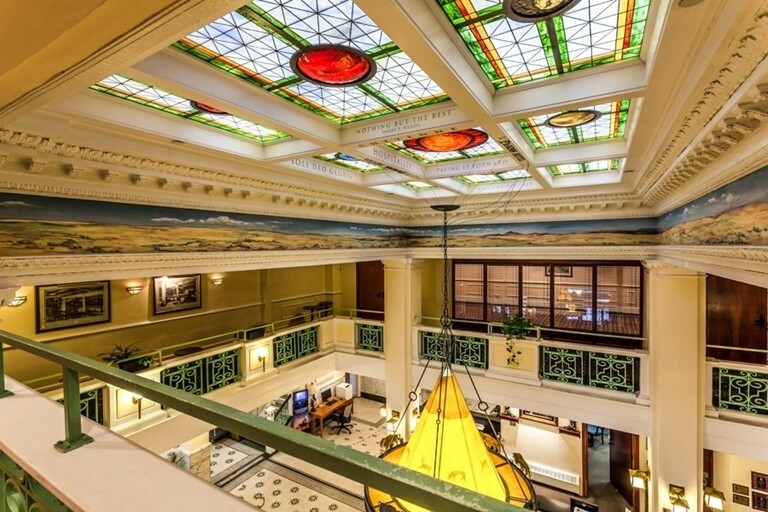 Soon after the Plains opened its doors a honeymoon couple checked in. This couple was given a suite on the 2nd floor. They had an argument stemming from the bride’s nervousness about their marriage bed. The groom impatient and angry left his brid and went down to the first floor bar. While there he met a local prostitute. Rosie, his new wife becoming concerned about how long her husband had been gone grabbed a gun for protection and headed toward the bar. She entered just in time to see her husband leaving with the shady woman. She followed them up to the fourth floor and watched as they entered a guest room. Upset, she gathered her courage and barged into the room only to find her husband in bed with this lady. Rosie now angry at this betrayal raised the gun she held and shot them both. Distraught, she then went back to her room and shot herself. This double murder, suicide resulted in an active haunting. Since, Rosie’s ghost has been seen wandering the second floor. She wears a blue gown and witnesses state she appears to be lost in thought with a look of disappointment on her face. Housekeepers state they have heard phantom wailing coming from the newlywed’s room and guests who have stayed in this suite state they have heard the actual argument that occurred between the bride and groom before the husband left for the bar. Rosie’s unfaithful husband is seen finely dressed. He wears 1900s formal attire with a long black coat and black polished boots. He has on a white shirt with silver buttons. He is seen on the 4th floor and throughout the hotel, including the basement. The prostitute is seen in a short red dress adorned with white lace. She is spotted on the 2nd floor and in the lobby area. Several witnesses have stated they have seen her in the balconies above the lobby. She has issues with brides. Several have claimed to encounter her while in the hotel. One Halloween, mannequins were displayed as a bride and groom. A witness saw a lady in a red dress push the bride mannequin over then she just disappeared. 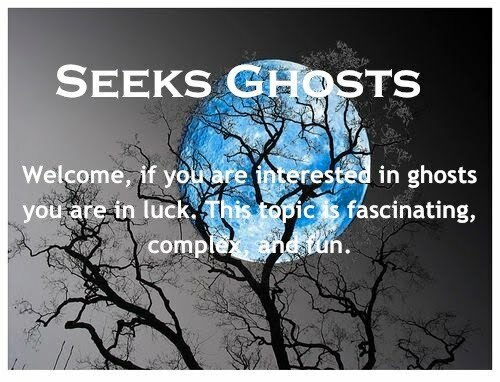 A fourth ghost seen in the Plains is that of a man who killed a guest. He engaged in an argument with this guest and shoved this poor soul out of a 4th floor window. Witnesses state they feel anger and a sense of dread in the area where this happened. When these ghosts are present, guests report doors and windows open without assistance. Gaineswood a southern plantation was built in southwestern Alabama in Demopolis on the eve of the Civil War in 1842. 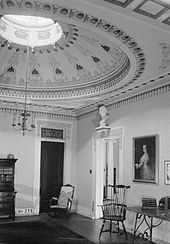 General Nathan Byron Whitfield designed his mansion to reflect the Greek revival style and had highly skilled artisan slaves build it. 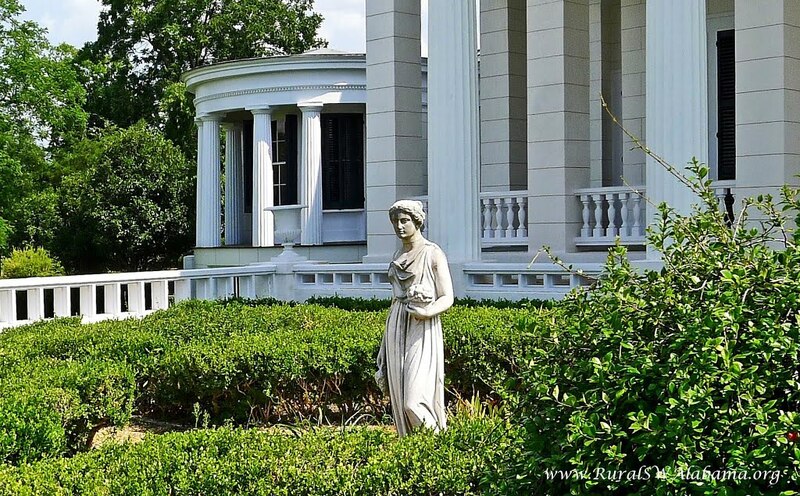 Today it is considered Alabama’s finest neoclassical home. It reflects 3 ancient Greek architectural orders: Doric, Ionic and Corinthian. It was used as a private residence until the late 1960s. 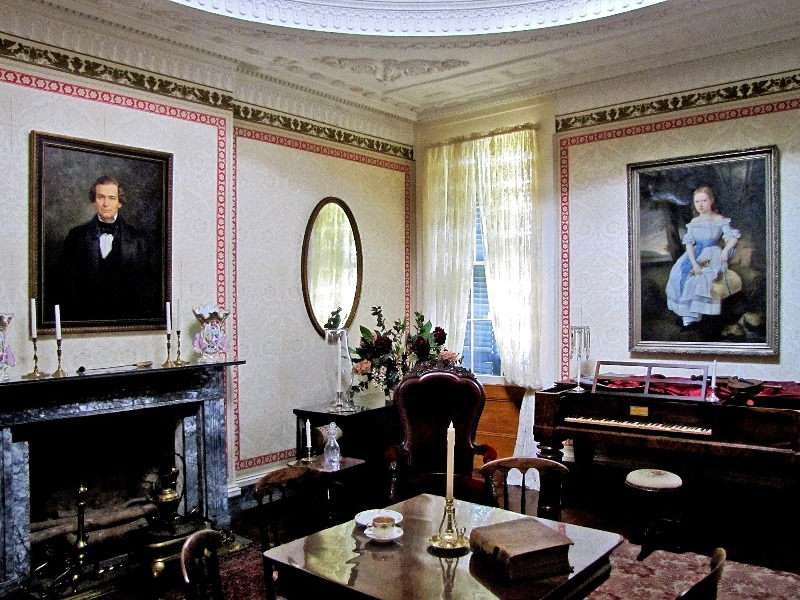 The house is beautifully preserved and still has fine Chippendale furniture throughout. It is on the National Register of Historic Places and is listed as one of 150 mansions in the U.S. that are must visits. Today it is run as a house museum. Tragically, soon after the mansion was completed, General Whitfield’s wife died. He was left with small children to rear. He hired a young gently bred lady, a Miss Carter to be his housekeeper and a companion for the children. Miss Carter’s nearest relatives were in Virginia and her father was in Europe serving as consul to Greece. Despite her duties keeping her busy the General noted Ms.. Carter was lonely. 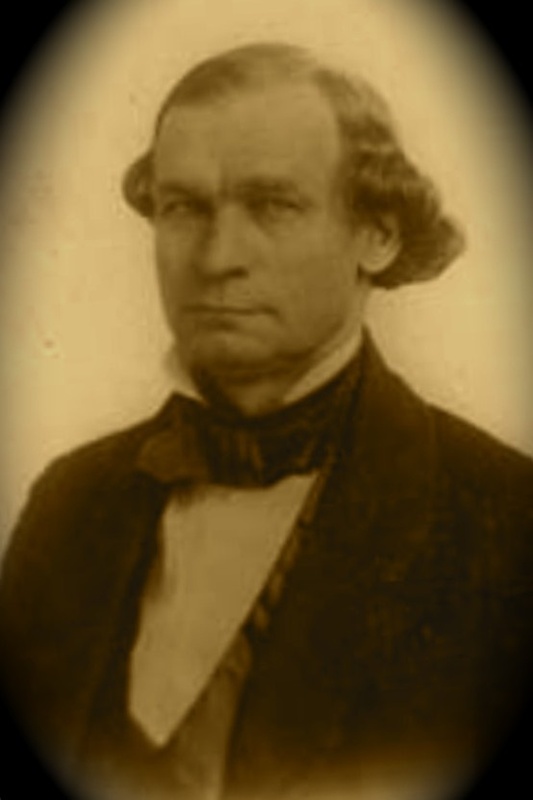 He gave her permission to invite her sister Evelyn to Gaineswood for the winter. Evelyn was a merry addition to the home. She loved to play the piano. The General also a musician often accompanied her. He enjoyed tunes from Scotland and would play duets with Evelyn on his bagpipes. Despite it being one of the coldest winters on record, Evelyn’s presence brought happiness to everyone. Tragically, Evelyn became ill. The General called in the best doctors but after several weeks Evelyn died. Depending upon which account one reads Evelyn died of a severe attack of malaria or pneumonia. In a more dramatic version it is stated she died of a broken heart. A handsome French count—an exile from the Napoleonic Wars—was visiting Demopolis. He became attached to Evelyn. He bought her an engagement ring but the couple quarreled. He snatched the ring from Evelyn’s hand and threw it into the bushes. He then left and never returned. Grief-stricken, Evelyn succumb to illness. Her last wish was to be returned to Virginia for burial. It being winter the roads were covered in ice and snow, it would also take Evelyn’s father weeks to return from Greece for the funeral. So a decision was made to place Evelyn’s body in an airtight pine box sealed with rosin. It was then placed below the stairs in the cellar. 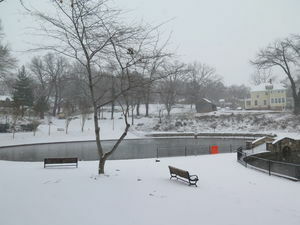 When spring arrived it would be taken to Virginia. The residents of Gaineswood came to believe because of this decision Evelyn’s spirit could not rest in peace. They believed she did not like being kept in a cold, dark cellar. Soon after being placed in the cellar people in the household began to hear footsteps coming up the cellar stairs. 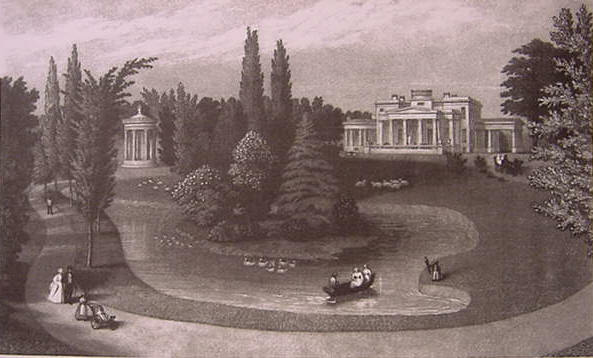 They would hear someone tip toe into the drawing room where the large piano stood. Faint sounds of music would float throughout the mansion. Most of these tunes were Scottish ballads. On several occasions when braver souls would venture down into the cellar these sounds would stop. But once they returned upstairs the musical sounds would begin again. These footsteps and music were so persistent they would wake the entire household. So when spring arrived everyone was happy. They believed their sleep would no longer be interrupted. But they were wrong. 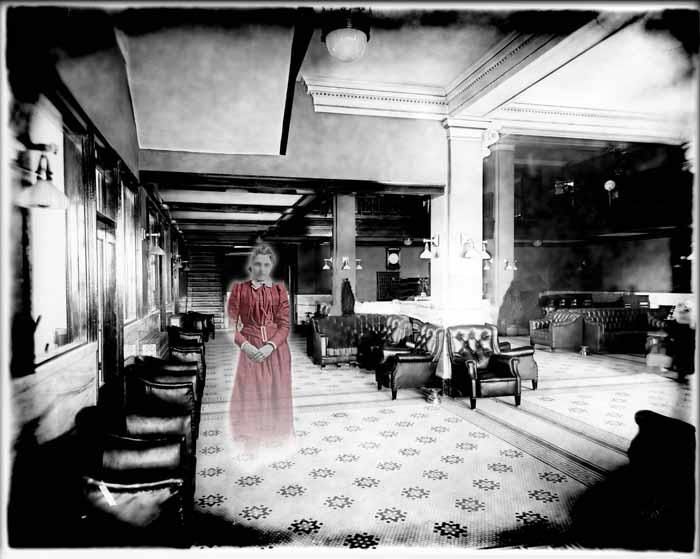 Even though the activity was not regular, Evelyn’s ghost continued to haunt Gaineswood. Apparently she was still protesting she was kept in the cellar for several months. Even in more recent years, when Gaineswood was still a private residence visitors would insist their dreams where interrupted by the sounds of soft footsteps on the cellar stairs—followed by the melodious sounds of songs long forgotten. 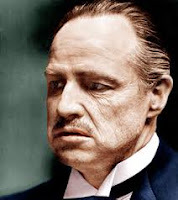 I was surprised to read a short account recently that stated the famous actor Marlon Brando felt a ghost haunted him. Brandon died in July of 2004, at age 80. The decade before his death he told friends and family that an angry ghost plagued his life. In earlier years, Brando had actually become obsessed with the paranormal. This was not widely known for despite his celebrity Brandon managed to lead a private life—at least up until his oldest son Christian committed manslaughter. 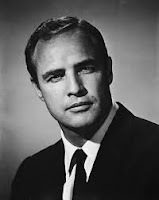 Brando rose to fame in the 1940s and 50s after attending the Actors’ Studio where he learned the Method Approach. This method emphasizes characters’ motivations. He gained celebrity statue after starring in Tennessee Williams’ play A Streetcar Named Desire in 1947. 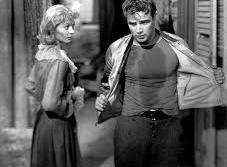 He played the role of Stanley Kowalski—a brute that rapes his sister-in-law the fragile Blanche DuBois. His early film roles, The Wild One and On the Waterfront both in 1954 made him an international star. His became known as one of Hollywood’s Bad Boys. His career had many ups and downs. He had a successful comeback in 1971 when he starred as Mafia chieftain Don Corleone in Francis Ford Coppola’s The Godfather. But his ongoing struggle with weight precluded him from receiving roles. Brando, a womanizer was married three times and had 11 children, five of them in wedlock. He had 3 others with a housekeeper and 3 from affairs. 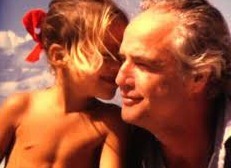 In 1991, Brando oldest son Christian became involved in a fight with his half sister’s fiancé, Dag Drollet. He felt Drollet was abusing Cheyenne, who was pregnant. He shot Drollet in the face during this struggle. Christian was drunk at the time. Christian received a ten-year prison sentence for manslaughter. He was released 5 years later. He found himself in trouble again in 2005 accused of spousal abuse. He died from a diagnosed case of pneumonia in 2008. Cheyenne struggled with drug addiction for years. She had spent time in and out of drug rehab as well as mental hospitals. After Dag's death she fell into a deep depression and became a recluse. Her mother, Tarita Teriiparia was given custody of her child. In 1995, while visiting her mother over Easter, she committed suicide by hanging herself at age 25. She once said she despised her father—for he ignored her as a child. 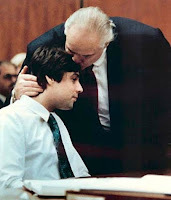 Friends and family, including Brando’s former wife, Anna Kashfi stated after these two painful episodes Brando was traumatized. He believed that Dag Drollet’s angry ghost haunted him. He experienced sheets being violently ripped from his bed as he lay in it. He also heard a voice whisper repeatedly, “I should not have died.” These incidents were said to terrify Brando. Always fascinated by the paranormal Brando spent the last few years of his life developing a project that involved the famous legend of the Angel of Mons. I share information about this legend here. He collaborated on this project with the Hollywood director, Tony Kaye. He hoped Brando would portray the main character in their story. But Brando died before the script was complete. 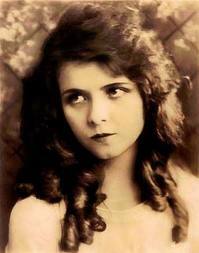 In 1920, Olive Thomas a former Ziegfeld girl and a silent screen actress was on a second honeymoon in Paris with her husband Jack Pickford. The two had been out partying and drinking when they returned to the Hotel Ritz. Olive in search of something to calm her nerves found in the suite’s bathroom a large blue flask that smelled like alcohol, she thought it was a sleeping draught that would help her. She drank it down. As this liquid flowed down her throat it burned. She screamed waking her husband in the next room. 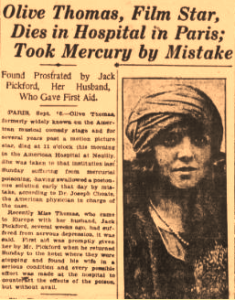 Too hazy to understand, she had ingested the topical mercury bichloride that Jack was using to treat his chronic syphilis. Jack tried to induce vomiting but this did not work. Olive was taken to the nearby Neuilly Hospital. In the hours that followed she had fits where she would gain consciousness briefly. She apologized to Jack, who stayed by her side, and then called for her mother. The amount of toxic fluid she ingested shut down her kidneys and she tragically passed. Jack accompanied Olive’s body back to the U.S. Her funeral service was packed, it was held at St. Thomas Episcopal Church in New York City. She was buried in Woodlawn Cemetery in the Bronx in September of 1920. 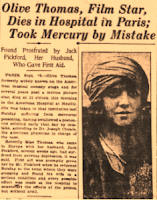 After the scandal of her death, the Hollywood studios used Thomas, the Arbuckle scandal (1921), which I discuss here and the murder of William Desmond Taylor (1922) to instate “morality clauses” into actors’ contracts. 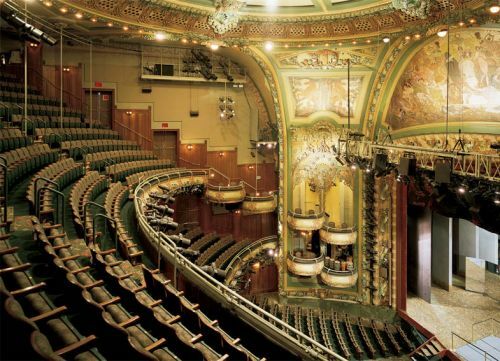 My favorite true ghost story author, Tom Ogden in his book Haunted Theaters retells several stories that indicate Olive Thomas’ spirit returned to haunt the New Amsterdam Theater shortly after her death. Olive’s ghost often appears partly faded. She has been seen both backstage and in the lounges at the New Amsterdam. She is seen wearing her green beaded dress with the matching headband and sash. A workman at the theater in 1952 saw her ghost twice. He noticed the name “Olive” written across her sash. Both times this figure disappeared right in front of him as she held a large blue bottle in her hands. 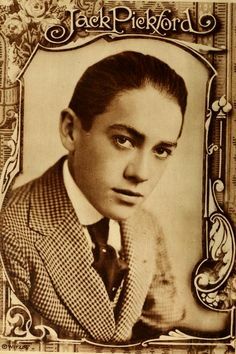 He recognized her without this ID for he had worked at the theater as a young man during the time she was a Ziegfeld girl. As many old buildings the New Amsterdam fell into massive disrepair over the years. One preservationist group tried to restore the building in the 1970s but failed. 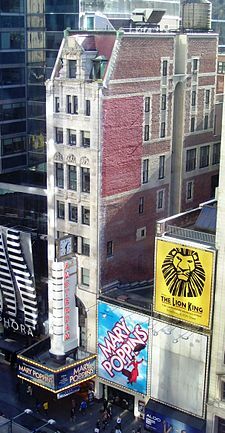 In 1979, the building was declared a New York City landmark. In 1993, Disney bought the building and spent $35 million restoring it. 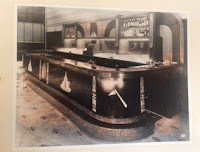 The man in charge of this restoration, Dana Amendola began to receive reports from workmen that the building was haunted. These reports did not surprise him for research he did on the history of the theater mentioned Olive, her tragic death and the fact her ghost lingers. Several night watchmen told him that they had seen a glowing image of a beautiful young woman on the main stage. They also saw this apparition in the dressing rooms. He said a demure smile formed on the woman’s lips. She then turned and drifted across the stage. He watched as she walked right through a solid outside wall. Olive’s ghost when seen always carries this blue flask. The male witnesses said she often flirted with them. She whispered, "Hi fella and then would bat her eyes before disappearing." She was also heard calling out, “Hey, how re doin’?” At other times night watchmen and workers found items moved without explanation. 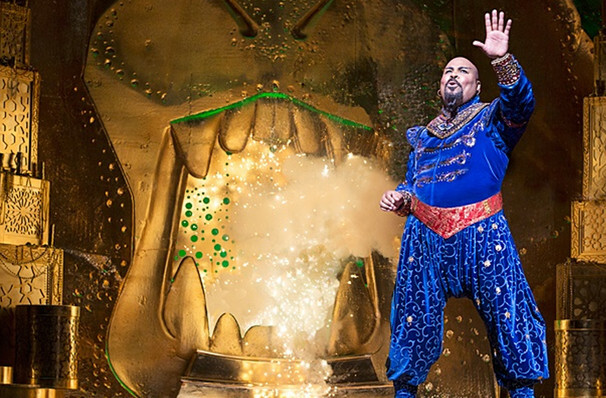 After Disney re-opened the theater to the public, cast and crew have reported seeing Olive's ghost. She appears at night after audiences have left. She has made the sets shake and she has caused all the lights to blow out in the upper floor offices. Her ghost tends to appear more often when changes are made. She has also been seen on the Amsterdam’s rooftop floating near where the old glass dance floor used to be. In Part l of Olive Thomas: New Amsterdam Theatre I talk about Olive’s scandalous time as a Ziegfeld girl and her marriage to Jack. Here is a brief video with Dana Amendola talking about Olive's ghost at the New Amsterdam.